How do I register my out of State (Foreign) corporation in California? 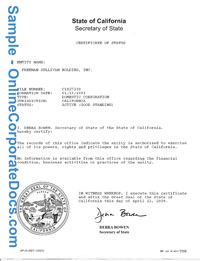 The California Secretary of States registers corporations and will issue a certificate of status to any registered corporation or LLC that is in good standing. There are two ways to obtain a California Certificate of Status - You can file a business records request form with the Secretary of State - This form can either be mailed (7-10 days process time) or submitted directly to the Secretary of States walkin desk in Sacramento for next day release - We have couriers who will delivery your request to the walkin desk today. There is no expiration date on the certificate - the validity of the certificate in terms of age will be determined by the organization that has requested it from you. For example your bank may request a Certificate of Good Standing that is less than 30 days old. Your entity must be legally Incorporated or registered as a Foreign Corporation with the California Secretary of State and must be in compliance with all statutory reporting requirements mandated by the State - Specifically you must be current in your filing of Annual Statement of Information and payment of your corporate franchise tax. Before transacting intrastate business in California the business must first qualify/register with the California Secretary of State by submitting a completed "California Statement and Designation by Foreign Professional Corporation" form along with a Certificate of Existence issued by that state or jurisdiction - View our Foreign Qualifications page for a more detailed explanation and a link to where the appropriate application form can be found. Usually filing your past due Statement of Information and tax payments to the State will bring you back into good standing If you are significantly behind there may also be penalties that apply - In this case contact the Secretary of State and confirm the years and amounts due. The California Secretary of State requires you to file a Statement of Information annually. How do I register my out of State (Foreign) corporation in Connecticut ? The Connecticut Secretary of States registers corporations and will issue a certificate of status to any registered corporation or LLC that is in good standing. There are two ways to obtain a Connecticut Certificate of Status - You can file a business records request form with the Secretary of State - This form can either be mailed (7-10 days process time) or we can retrieve the certificate of your behalf. Your entity must be legally Incorporated or registered as a Foreign Corporation with the Connecticut Secretary of State and must be in compliance with all statutory reporting requirements mandated by the State - Specifically you must be current in your filing of Annual Statement of Information and payment of your corporate franchise tax. Before transacting intrastate business in Connecticut the business must first qualify/register with the Connecticut Secretary of State by submitting a completed "Connecticut Statement and Designation by Foreign Professional Corporation" form along with a Certificate of Existence issued by that state or jurisdiction - View our Foreign Qualifications page for a more detailed explanation and a link to where the appropriate application form can be found. The Connecticut Secretary of State requires you to file a Statement of Information annually. Who issues a Delaware Certificate of Good Standing? How do I register my out of State (Foreign) corporation in Delaware? The Delaware Secretary of States registers corporations and will issue a certificate of good standing to any registered corporation or LLC that is in good standing. There are a number of ways to obtain a Delaware Certificate of Good Standing - Most file a business records request form with the Secretary of State - This form can either be mailed (7-10 days process time) or submitted directly to the Secretary of States office in Dover, DE for next day release - We have couriers who will delivery your request to the walkin desk today. Your entity must be legally Incorporated or registered as a Foreign Corporation with the Delaware Secretary of State and must be in compliance with all statutory reporting requirements mandated by the State - Specifically you must be current in your filing of Annual Statement of Information and payment of your corporate franchise tax. Before transacting intrastate business in Delaware the business must first qualify/register with the Delaware Secretary of State by submitting a completed "Foreign Qualification" form with the Division of Corporations along with a Certificate of Existence issued by that state or jurisdiction.- View our Foreign Qualifications page for a more detailed explanation and a link to where the appropriate application form can be found. The Delaware Secretary of State requires you to file a Statement of Information annually. Who issues a Florida Certificate of Good Standing?...? How do I register my out of State (Foreign) corporation in Florida? A Florida Certificate of Status is issued by the Florida Dept. of State Division of Corporations. Before transacting intrastate business in Florida the business must first qualify/register with the Florida Dept of State by submitting a completed "Foreign Registration" form with the Bureau of Corporations along with a Certificate of Existence issued your home state or jurisdiction.- View our Foreign Qualifications page for a more detailed explanation and a link to where the appropriate application form can be found. The Florida Secretary of State requires you to file a Statement of Information annually. Who issues a Pennsylvania Certificate of Good Standing? How do I register my out of State (Foreign) corporation in Pennsylvania? A Pennsylvania subsistence certificate is issued by the Secretary of the Department of State for the Commonwealth of Pennsylvania. There are a number ways to obtain a Pennsylvania Certificate of Good Standing - Most file a business Copy/Certification Request form with the Bureau of Corporations - This form can either be mailed (7-10 days process time) or submitted directly to the Dept of States office in Harrisburg, PA for next day release - We have couriers who will delivery your request to the walkin desk today. Your entity must be legally Incorporated or registered as a Foreign Corporation with the Pennsylvania Dept of State and must be in compliance with all statutory reporting requirements mandated by the State - Specifically you must be current in your filing of Annual Statement of Information and payment of your corporate franchise tax. Before transacting intrastate business in Pennsylvania the business must first qualify/register with the Pennsylvania Dept of State by submitting a completed "Foreign Registration" form with the Bureau of Corporations along with a Certificate of Existence issued by that state or jurisdiction.- View our Foreign Qualifications page for a more detailed explanation and a link to where the appropriate application form can be found. The Pennsylvania Secretary of State requires you to file a Statement of Information annually. Who issues a New Jersey Certificate of Good Standing?...? How do I register my out of State (Foreign) corporation in New Jersey? A New Jersey Certificate of Incorporation is issued by the Secretary of the Department of Treasury for the State of New Jersey. There are a number ways to obtain a New Jersey Certificate of Good Standing - Most file a business Copy/Certification Request form with the Dept of State - This form can either be mailed (7-10 days process time) or we can retrieve within 24 hours. Your entity must be legally Incorporated or registered as a Foreign Corporation with the New Jersey Dept of Treasury and must be in compliance with all statutory reporting requirements mandated by the State - Specifically you must be current in your filing of Annual Statement of Information and payment of your corporate franchise tax. Before transacting intrastate business in New Jersey the business must first qualify/register with the New Jersey Dept of Treasury by submitting a completed "Foreign Registration" form with the Bureau of Corporations along with a Certificate of Existence issued by that state or jurisdiction.- View our Foreign Qualifications page for a more detailed explanation and a link to where the appropriate application form can be found. The New Jersey Secretary of State requires you to file a Statement of Information annually. Who issues a New York Certificate of Good Standing?...? How do I register my out of State (Foreign) corporation in New York? A New York Certificate of Incorporation is issued by the Secretary of the Department of State for the State of New York. There are a number ways to obtain a New York Certificate of Good Standing - Most file a business Copy/Certification Request form with the Dept of State - This form can either be mailed (7-10 days process time) or submitted directly to the Dept of State office in Albany, NY for next day release - We have couriers who will delivery your request to the Dept of State today. Your entity must be legally Incorporated or registered as a Foreign Corporation with the New York Dept of State and must be in compliance with all statutory reporting requirements mandated by the State - Specifically you must be current in your filing of Annual Statement of Information and payment of your corporate franchise tax. Before transacting intrastate business in New York the business must first qualify/register with the New York Dept of State by submitting a completed "Foreign Registration" form with the Bureau of Corporations along with a Certificate of Existence issued by that state or jurisdiction.- View our Foreign Qualifications page for a more detailed explanation and a link to where the appropriate application form can be found. The New York Secretary of State requires you to file a Statement of Information annually.